Bath businesses have proved again that they are among the happiest in the region in a unique contest to find firms that go the extra mile for their staff. Bath-based eyewear design house INSPECS was crowned the overall South West winner in the Happiest Workplace competition, while Wessex Water, energy provider Pure Planet and Pukka Herbs also landed coveted awards for their approach to staff wellbeing. The competition, now in its fourth year, is staged by interior design consultancy Wylde IA to find businesses that ensure their staff are cheerful and fulfilled. Last year Bath’s Circle Hospital was named as the South West’s happiest workplace for its ‘truly-inspiring’ ethos and environment. This year the competition had the support of mental health charity MIND, so the judges paid particular attention to those supporting mental health and wellness in the workplace. INSPECS wowed this year’s judges with its stylish, creative open space in its UK headquarters on Upper Bristol Road, which reflects the company’s working style and philosophy – a non-traditional office which feels peaceful, calm and harmonious with a buzz of creativity, chatter and warmth. The judges said the team was “close knit with a strong family feel, full of friends who have worked together for many years”. Staff enjoy regular social events, gifts, flexible working, a generous holiday allowance and pension scheme. The company operates a flat structure where everyone is encouraged to step forward with ideas and contribute towards the success of the company. 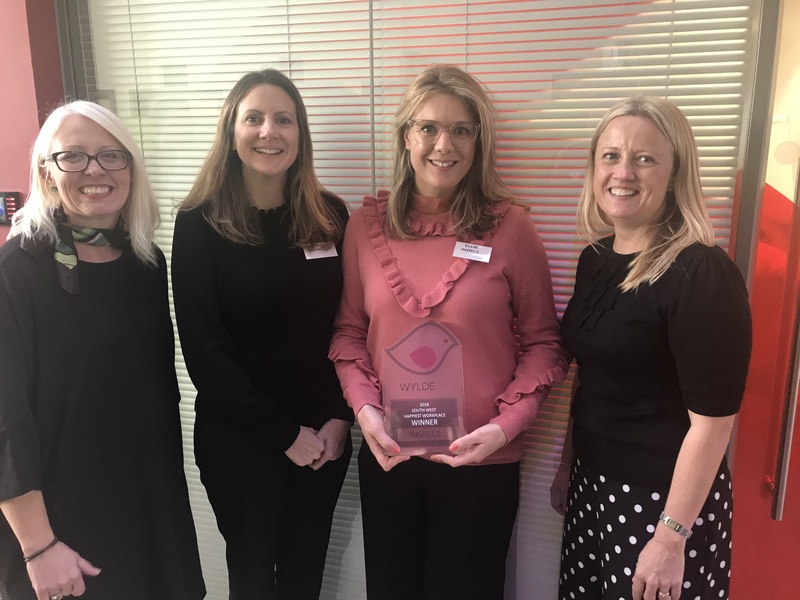 INSPECS CEO Robin Totterman says: “INSPECS is thrilled that our company’s workspace philosophy has been recognised by Wylde IA as giving us ‘the happiness advantage’ – thank you! “Very simply, we wanted our workspace to be a good place to be – a lifestyle-friendly location, a colourful space to be creative, a clear space to think, and a friendly space to work together. Competition judges were also impressed with Wessex Water’s People Programme initiative where staff wellbeing is a top priority with 30 employees trained as mental health first aiders. Claverton-based Wessex Water won the title of Bath’s happiest large company. Wessex Water director of corporate affairs Marilyn Smith said: “We’re delighted to have won this award. We have initiatives, such as Going the Extra Mile (GEM) that acknowledges staff when they have gone above and beyond, and a wellbeing programme that supports colleagues. Pure Planet won the Bath medium-sized business award for creating a bright and cheerful open plan office on Upper Borough Walls with a real buzz of energy and productivity. Staff enjoy flexibility in work schedules to allow time for self-care. Benefits include unlimited holiday, equal parental leave, an ethical pension scheme, health insurance and a ‘green’ car scheme. Ethical tea firm Pukka Herbs, which earned the title of Happiness Workplace in Somerset, relocated its HQ from South Bristol to the Herb House – part of the former Cadbury’s chocolate factory at Somerdale, Keynsham – earlier this year. Judges said the office stood out for its beautifully decorated spaces full of plants and natural light. Staff can make use of the many ‘think’ and ‘phone’ pods for privacy and concentration, a large kitchen is designed for socialising, a tech free retreat and yoga space. The company organises ‘nourish’ lunches every Wednesday where colleagues share homemade soup with fellow colleagues. Staff can also make use of a Learning Academy – an online learning portal providing hundreds of courses plus a personal development fund of £600. Pukka Herbs founder and managing director Tim Westwell: “We have been on an exciting journey with Pukka, from setting up in my spare bedroom in 2001 to moving into the third floor of the Keynsham-based Chocolate Factory earlier this year. “We took over five years to find the most appropriate space for our Herb House, which is now home to over 100 Pukka people and reflects our love of the beauty and symmetry of nature, whilst being versatile enough to allow for different working styles, using standing desks and sound proof ‘think pods’. Furniture companies Allermuir and Senator Group and iconic lamp manufacturer Anglepoise supported this year’s competition by donating prizes for the winners and also helped with the judging process. The winners received their awards at an awards ceremony hosted at the Bristol & Bath Science Park. Bath Business News and its sister titles are delighted to have supported the competition as media partner since its launch.